When is a convention not a convention? The Government, directly or indirectly, has recently sought to address two conventions of the constitution and to do something about them: in one case, supposedly to enforce the convention and in the other to put it in statute. In the former case, Lord Strathclyde was appointed to look at the claimed convention that the House of Lords does not refuse approval to statutory instruments and in the latter case the Government are seeking to put the Sewel Convention in statute, through Clause 2 of the Scotland Bill. There are, to put it mildly, problems in both cases. 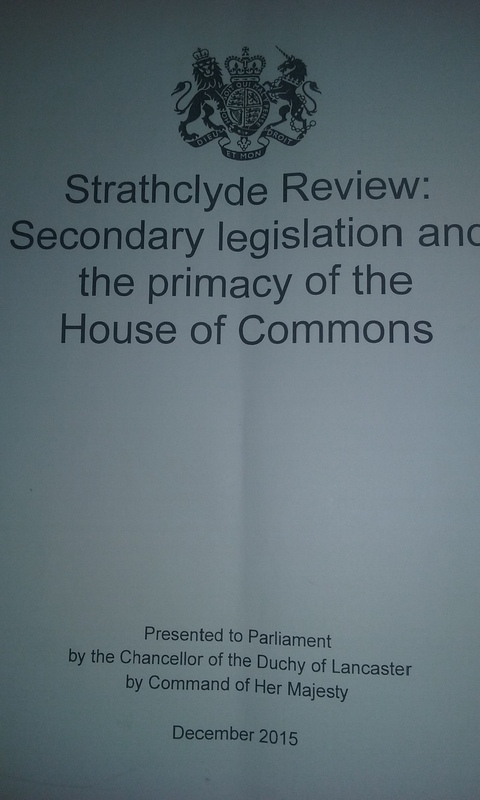 I have previously written about the Strathclyde Review of Secondary Legislation and why what Lord Strathclyde claimed was a convention was not a convention. When quizzed on this when he was appearing before the Public Administration and Constitutional Affairs Committee in the Commons recently, Lord Strathclyde said he was not covering conventions of the constitution but ‘conventions of the House’. As I have pointed out in evidence to the Secondary Legislation Scrutiny Committee, which is doing a short inquiry into the review, this is problematic for two reasons. First, the definition offered in the review is that of a constitutional convention – they are ‘binding on those who come to agree them’. Even if that was taken as also a feature of conventions of the House, there still is no convention as the House has not felt bound by it. Second, if Lord Strathclyde was reviewing a convention of the House, it is not clear what authority the Prime Minister had to invite him to undertake such a review. A convention is a non-legal rule of behaviour that is considered binding by those who are covered by it and is justified by being, as David Feldman put it, “right behaviour”. There is a moral imperative, and compliance with the rule is invariable. Invariable practice, lacking a moral base, does not establish a convention. Usual practice, as distinct from invariable practice, does not establish a convention. Conventions develop: a precedent is set and followed and a practice is established from which there is no deviation. In addressing this House in 1998, Lord Sewel recognised that a convention is something that developed. However, his use of the word “normally” meant that what he had in mind was not and could not be a convention. What has developed is a practice, and one that has extended beyond what he said. Clause 2, as it stands, makes no sense. Conventions may be transposed into statute, but once in statute the convention has gone; it has been superseded by statute. We saw a recent example with the convention governing votes of confidence in the House of Commons. That has been superseded by Section 2 of the Fixed-term Parliaments Act. There is no longer a convention. What we have with Clause 2 is the inclusion of the words of Lord Sewel in a form that does not constitute a convention but with the Government believing that it is a convention and seeking to maintain it as a convention even though enshrined in statute. I was going to say that I hope that that makes sense, but of course it does not make sense. This clause is nonsense. The noble Lord, Lord Norton, observes that that is not a convention in the conventional sense; and, of course, he is right because a convention is something that grows up and is invariably applied or employed. Where you have the word “normally”, you are saying that there can be a qualification or an exception, so, strictly speaking, in constitutional terms, the Sewel convention is not a convention. But, you know, by convention it became a convention. And that is where we are. Over a period of years, what was referred to as the Sewel convention was understood not only by the United Kingdom Parliament but also by the Scottish Government and by the Civil Service. They understood and applied the Sewel convention, albeit that in strict constitutional terms it was not a convention. They operated it successfully and without difficulty until now. Then the Smith commission decided that the Sewel convention should be put on a statutory footing. Of course, the technical difficulty is this: if you express a convention in statutory terms, it ceases to be a convention. In a sense, we do not have that problem here because, as the noble Lord, Lord Norton, pointed out, it was not a convention in the first place. This is confused at so many levels. The practice that developed was invariable and was recognised as a convention – dubbed the Sewel convention – and logically it is this which should be in the Bill. That is recognised by the Scottish Government. As one of its officials said to the Constitution Committee: ‘You need to enact the convention rather than the quotation’. The minister’s admission that what was being enacted wasn’t a convention was rather strange given that the clause was included in the Bill in pursuit of a commitment to put the Sewel convention into statute and the clause is headed ‘Sewel convention’. The Government have been tying themselves in knots in trying to avoid putting the Sewel convention, rather than the words of Lord Sewel (which, by inclusion of the word ‘normally’, gives it is a let-out), in statute, while claiming to be implementing the Smith Commission recommendations. The clause remains a nonsense. As I said in concluding, if it remains in the Bill ‘it will be a public demonstration of how not to legislate’. It is still in the Bill. This entry was posted in Uncategorized and tagged constitutional conventions, Lord Keen, Lord Strathclyde, Scotland Bill, secondary legislation, Sewel convention, Strathclyde Review. Bookmark the permalink. 6 Responses to When is a convention not a convention? You have to face facts, LN, the ‘House’ is no longer filled with the brightest minds. Akin to all our institutions, your place of work is being dumbed down as equality and not exception is the frontrunner we must ‘willingly’ succumb to. I’m unsure: is this a roundabout way of calling the Government a bunch of duplicitous fils de bast? I think words penned by my colleague, Lord Dobbs, come to mind. How tight is tight? LOL. Can this be the same Dobbs? Observe, that it is not a convention in the conventional sense; because a convention is something that grows up and is invariably applied or employed. But you know, by convention it became a convention. And that is where we are! England needs to do its duty as Elizabeth observed.